Most pinball LED’s that I’ve come across are not compatible with the early Bally solid state pinball machines from 1979 to 1985. These machines use a lamp driver board, where each controlled lamp is driven by a silicon control rectifier (SCR), which is also known as a thyristor. Bally’s Medusa falls into this category. An LED installed into a Bally of this vintage will flicker or not work at all. The problem can be overcome with a 1000 ohm (1K) resistor in parallel with the LED. The reason for the flicker is somewhat technical and is explained below. Some people opt to solder a resistor across every lamp socket. This isn’t too much of a problem if the number of lights is not high. Medusa has over 80 controlled lights and that would be a lot of work, especially on the hard to get at sockets. Since one side of each lamp is common to all of the others, a pull-up type resistor network can be used. Also, since the connector pin spacing on the lamp driver board is 0.100″, this is a perfect match for using though-hole resistor networks because the pin spacing is the same. Rear of Lamp Driver board showing resistor networks (pullups) installed. Click for larger. The resistor networks were laid horizontally next to the lamp output pins on the reverse side of the board (the view from the front of the board is unchanged and you’d never know the resistor networks are there). The common pin from each network was bent up vertically where a wire connected all of them together (blue wire in the above photo). 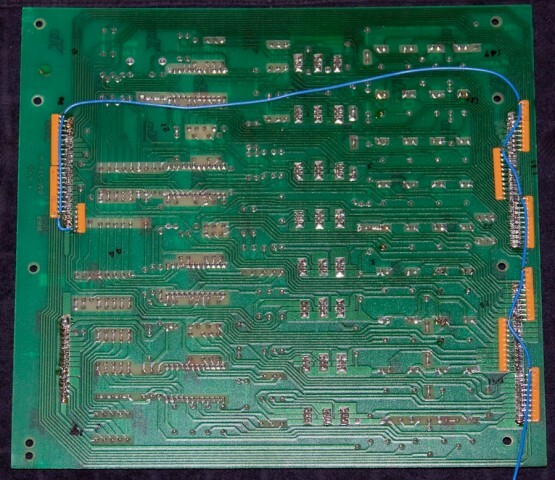 The blue wire was routed through a single pin connector to the lamp common on the backboard. The single pin connector allows the driver board to be removed from the backbox. Another nice thing about doing it this way, as opposed to putting a resistor on every socket, is if the machine is ever sold and the new owner (a purist) wants to switch back to regular #47 incandescent lamps, the resistor networks can easily be removed from the back of the circuit board (though incandescent lamps will work perfectly if the resistor networks remain in place). 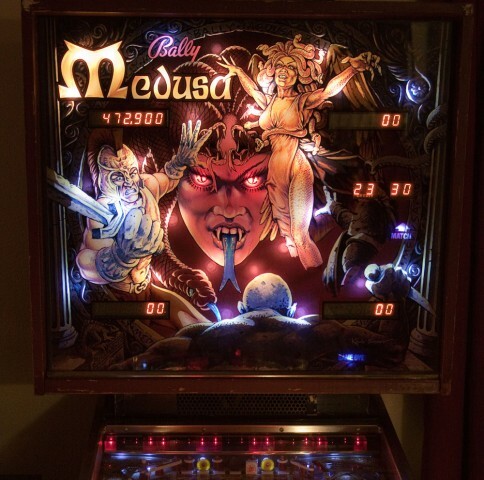 On Medusa, there is a light bar at the top of the playfield. It was decided to leave those as incandescent lamps. A LED can turn off and on faster than an incandescent bulb, and I think with today’s bright LED’s and the fact they are aimed right at the player, the flashing would be a bit too much. Aside from that, all controlled lamps and general illumination on the playfield and backbox were replaced with LED’s. 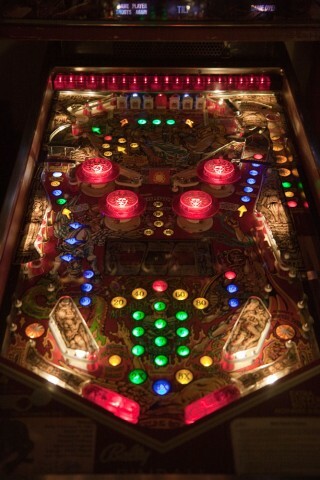 Playfield with all LED lighting (except for row of red lights at the very top). 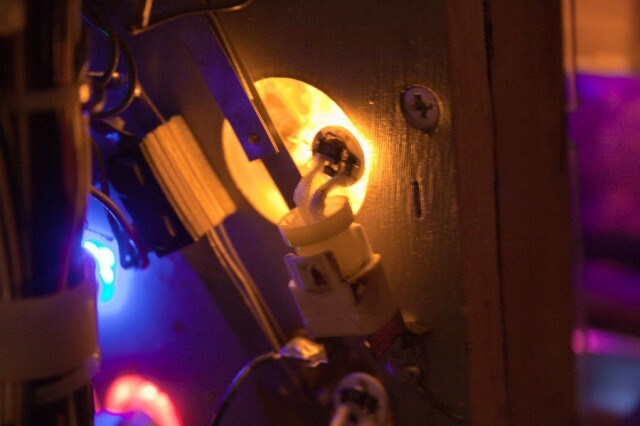 Warm white LEDs were used for under playfield plastics. New translucent polyurethane flipper rubbers were used on the illuminated flippers. Click for larger. Backgox LED lighting, with a mixture of warm white, cool white, and red LEDs for the eyes. Side LED’s from Cointaker.com were used in places like the Gorgon rollover switches. 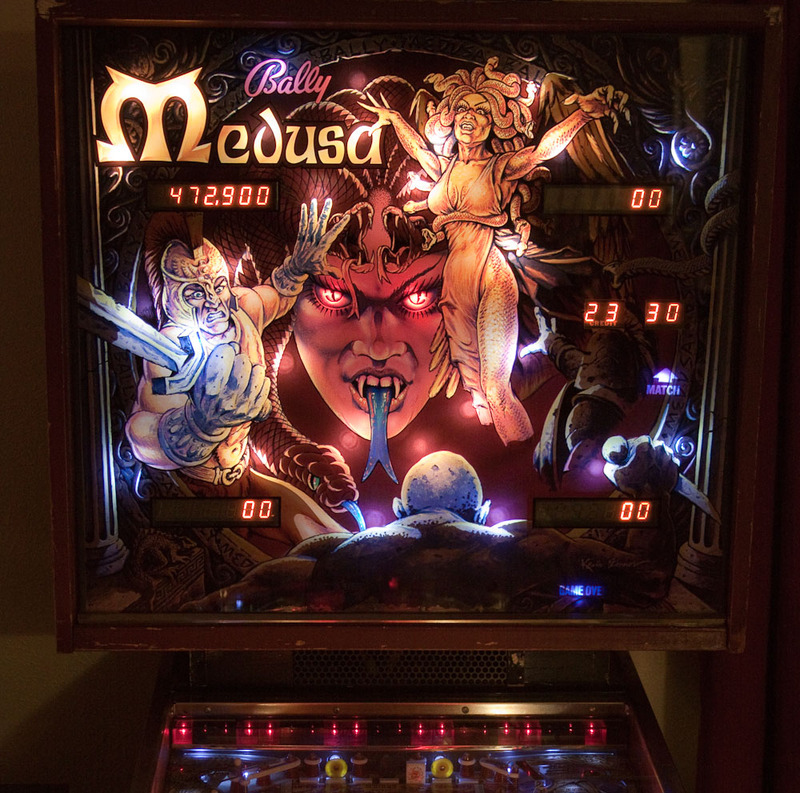 I’m not totally sold on the idea of upgrading older machines with LEDs, but all in all, I think it’s an improvement for Medusa.